The Frugal Burqueño: Something Gained, Something Lost. 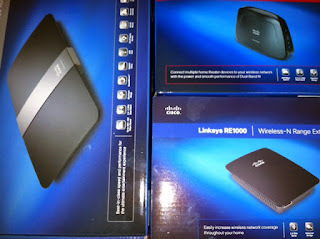 Good news is that as a finalist I received a wonderful prize package (worth about $450) from Linksys :-) It includes a wireless-N Range Extender, a 4-Port Dual-Band N Entertainment Bridge and a Maximum Performance Dual- Band N900 Router. Yeah, I didn't know what to do with them but our geek daddy knows what they are for and is going to use them all ! Thank you Linksys for the prize that will upgrade our technology system! Thank you all so much for voting for my entry. I really appreciate your time and your help. To my friends and family in Poland- I'm so thankful for your efforts! You're great in English! I don't think I will enter a voting contest again. I am proud I played fair! I wish so much that you would have won! You definitely had the best story, and I believe that your family deserved it the most (maybe I am just biased!) But I am also glad that you didn't sink to others level, and did the right thing even though you didn't have to. I am proud of you! And I'm glad that you got SOMETHING for all of your efforts! Congratulations! This is cool news: my mom won a router! They gave away 10 routers in a random drawing amongst people who voted. Unbelievable :-) She voted for me every single day! Love my Mom!